HACKETTSTOWN, NJ, U.S. — American Heritage Chocolate, made by Mars Wrigley Confectionery, LLC (MWC), has announced the launch of its 360-degree re-brand that encompasses a new brand identity, reimaged product packaging, a revised product recipe available in four new formats, and a redesigned brand website. American Heritage Chocolate was developed in 2006 by the legendary advocate of American History and chocolate’s unique story in the Americas, Forrest E. Mars, Jr., and a multi-disciplinary team of historic site food historians. The chocolate brand’s new brandmark is the Heritage Tree, depicting a symbolic abstraction of a flourishing cocoa tree. Conveying chocolate’s deep historical and cultural roots, it celebrates its living, ongoing story of connection – hence, the new brand tagline: Savor the Stories. Primary packaging features the abstracted brandmark and has adopted a deep red hue for its dark chocolate, and a cool blue for its milk chocolate products – a shade inspired by 18th century sugar cone packaging. With an updated recipe, the brand’s unique flavor profile makes it a joy to explore new and cherished recipes for bakers/makers. Like the complexity of a fine wine, a bite of American Heritage Chocolate reveals layers of taste. The mildly spicy recipe is flavored with a blend of ingredients available during the 18th century that include hints of chili peppers, vanilla, and crisp orange. The brand is launching several new and improved ways individuals can make, bake, drink, enjoy and share American Heritage Chocolate. For those who want just a bite, there are new Tasting Squares. The brand is also launching a Tablet Bar. Bakers will enjoy the taste and convenience of Finely Grated Chocolate in re-sealable packets. And for the ultimate sipping experience, the brand offers a new Gourmet Hot Cocoa, that can also be served chilled or as an adult beverage. There is also a full line of products in bulk packaging. American Heritage Chocolate is 57% cocoa, Rain Forest Alliance Certified™, Kosher chocolate and contains no preservatives. 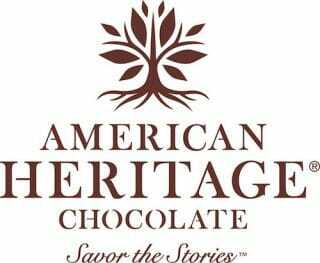 As part of the re-brand, American Heritage Chocolate is launching a new website. The new site will feature proprietary brand recipes, “how-to” videos for home bakers, a blog for sharing chocolate stories, a comprehensive timeline that tracks chocolate’s story through global history, and an events section that features historic site partner chocolate-making demonstrations, chocolate history lectures and more. As American Heritage Chocolate launches its re-brand, the company continues to grow its commitment to the mission of education. In a major step to fulfill Forrest E. Mars, Jr. and the Mars Family’s long-standing legacy, the brand partnered with National Geographic Books to publish Great Moments in World History: Global Stories Where Chocolate Sparked Discovery, Innovation, and Imagination! This free educator’s guide is a STEM-based, 14-week common core-aligned curriculum that teaches history through the lens of chocolate, making learning fun! 2018 also marks the launch of a partnership with nonprofit First Book, a nonprofit social enterprise focused on equal access to quality education for kids in need. Their co-programming includes creating special teacher appreciation packages for educators serving children in low income communities across the U.S., offering teachers credit toward purchasing material on the First Book ecommerce platform, and holding virtual classroom experiences with the brand’s Chocolate Historian David Borghesani. Other books developed by the brand include “Chocolate: History, Culture, and Heritage,” published in 2009 by Wiley featuring contributions from 45 authors, including researchers, culinary chefs, food scientists and historians from leading historic institutions. Additionally, MWC, in partnership with the National Geographic Books, published “Great Moments In Chocolate History,” in 2015. This book brings chocolate’s story to life through detailed information and extraordinary images based on decade’s worth of research by MWC and our uncommon collaborators. American Heritage Chocolate is sold at over 100 fine gift shops at historic sites, museums and historic inns across the USA and Canada. The brand can also be found on Amazon.com, at M&M’s World in New York City and Las Vegas, and at the Ethel M chocolate store in Henderson, Nevada. For a complete listing, or to purchase online, please visit our website.